Villa AVRIL THREE BEDROOMS AVAILABLE NOW ! EMAIL FOR RATES ! THREE BEDROOMS NOW, CAN SLEEP 6 IN SEPARATE BEDS!!! The Villa is a 3 BR, A/C (split system very quiet). The master bedroom is 16x20 with cathedral ceiling, natural cypress planking and white rafters. All floors throughout are Italian marble.The master garden bath is spacious with two shower heads and unique artistic plumbing. Living area is open and airy, with antiques collected from the Caribbean over the years of island hopping. Years of work as a professional chef, aided in the design kitchen, simple and easy, marble counters and custom-made cast sink with service bar, and all the equipment needed for a special night. Dining is on the Terrace overlooking the gorgeous view and pool. Zero-edged pool makes a wonderful feature, water is same level as the floor, creating a bubbling fountain effect. Decks on the sides of the pool, barbeque, chaises, hammock complete the setting for a relaxing day. The living and dining is open and breezy with large veranda roofs We have lived in the Caribbean all our lives and have put that experience into the Villa. My wife April and her fishing buddies, in Anegada, BVI. We have lived in Virgin Islands all our lives and know what works. Avril is very unique and Creole style living. I know you will love it being one with nature. Watch out for the turtles in the bathroom as they love to eat the Orchid flowers when they drop.. Pool is right there and you can just hang out inside or out, plenty of breeze and fully equipped for you. toilet, shower, Ensuite bathroom with third bedroom for one guest. king beds can be split to two separate twin beds in each room. Villa Avril was the perfect place for us to stay during Bucket Regatta 2019. Great location and view within minutes (walking) of Anse des Cayes. Recently renovated, the villa is roomy and comfortable, w seperate bath/shower for each bedroom. Pool, grill, flat screen TVs, and wifi, Villa Avril has it all. Byron (the owner) was very helpful, and made our stay as easy as could be. Villa Avril was perfect for our stay. It was super clean and comfortable, the kitchen and bathrooms were updated and very nice. It was actually more contemporary than we thought from the pictures, which looked a touch shabby, so that was a very nice surprise! My only complaint is that it was quite hard to locate the specific house initially from the directions. I think there needs to be a better marker on the house. Otherwise, completely delightful! New renovations very modern and open with no bugs ! New complete interiors, bedding too. Ultra convenient too with grocery 3 mins and st, jean and Gustavia 5 mins.. a real neighborhood too.. Thank you for your kind review and please come back soon!! Villa Avril will not disappoint. It is clean, well equipped and beautifully situated with water views. The villa has an "open air" living, dining and kitchen space that leads directly to the pool and patio. However, the two bdrms are secured and air conditioned. Each bdrm has a bathroom which are "open air" although enclosed for privacy. It is truly a unique and memorable place to stay. The owner was extremely helpful, warm and friendly. We stayed with our 2 children, ages 6 and 9. They loved the villa and the heated pool. The villa also comes with beach chairs, umbrella and cooler as well as snorkeling gear. We had a wonderful vacation and cannot wait to return to St. Barths. 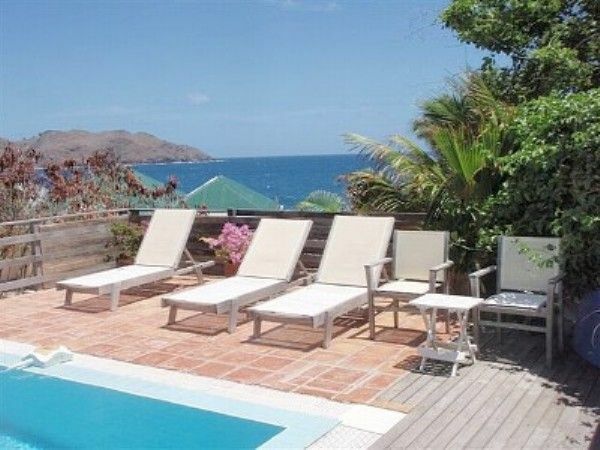 Located between Anse des Cayes and Anse des Lezards, 100 yards from the yards from the waters edge, Villa Avril has the sounds of the surf all the time. Walking to the white sand beach of Anse des Cayes takes about 3 mins down a gentle hill, my children walk there all the time when we are on the island. The neighborhood is very calm and quiet, the road dead-ends at Anse des Lezards so there is no thru traffic. You can walk to the beach in Anse des Cayes and go swimming or go to Manapany Hotel for some food and drinks. There is a nice little grocery in the neighborhood, also a Salon Mixte, beauty shop, and three local restaurants Chez Yvon, Chez Ginette, and New Born, which specializes in fresh seafoods. Gustavia is 5 minute drive, St.Jean Bay is 4 minutes. Rate is different depending upon how many guests and how many bedrooms.